Touring a city ravaged by the earthquake that killed at least 413 people, Ecuadorean President Rafael Correa on Monday contemplated a rebuilding costing billions of dollars and a potentially "huge" impact on the fragile OPEC economy. But the traumatized survivors Correa met on his rounds two days after the magnitude 7.8 quake had much more immediate concerns: many asked him for water. With the death toll likely to rise further and swaths of flattened homes, roads and bridges coming to light, a visibly moved and grim-faced Correa warned that Ecuador's biggest disaster in decades would put a big toll on the poor Andean country. 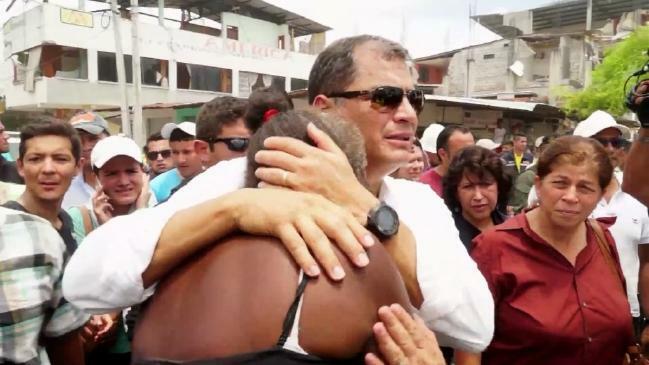 "Reconstruction will cost billions of dollars," said Correa in the hard-hit city of Portoviejo, where survivors swarmed him asking for aid. The economic impact "could be huge," he added later. Growth in the country of 16 million, which is largely dependent on oil and exports, was already forecast near zero this year due to plunging oil income. The energy industry appeared to have dodged damage although the main refinery of Esmeraldas was closed as a precaution. However, exports of bananas, flowers, cocoa beans and fish could be slowed by ruined roads and port delays. 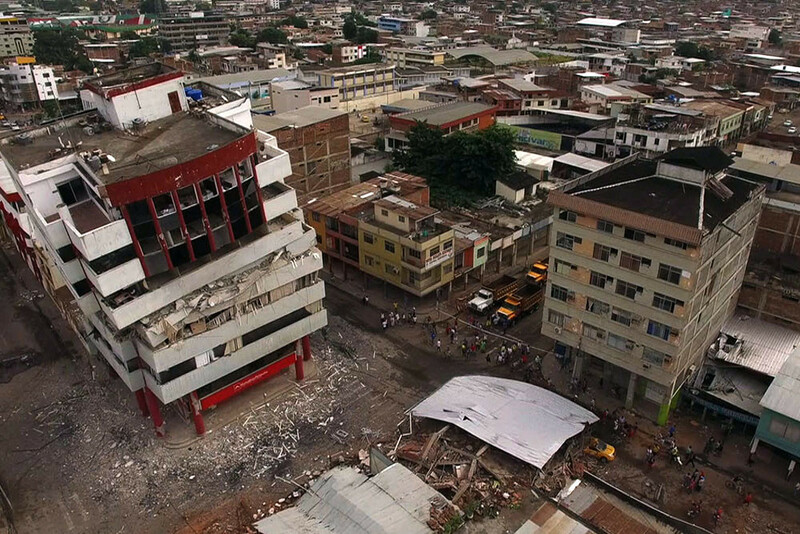 Michael Henderson, at risk consultancy Maplecroft, said Ecuador was less well equipped to recover than Chile, where a 2010 earthquake caused an estimated $30 billion in damage. 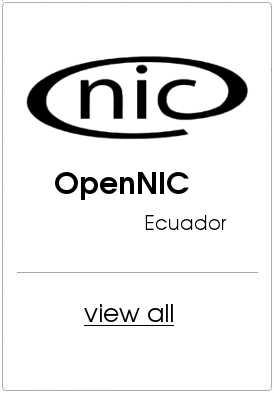 "Whereas Chile's economy was rebounding strongly from the global financial crisis ..., Ecuador has been slowing sharply recently as lower oil prices depress activity," he said. "But total damage to assets in dollar terms may be quite a bit lower than in Chile due to the smaller magnitude of the earthquake and the fact that Ecuador is a much poorer country." The quake struck Saturday night along the northwest coast, while Correa was in Italy. Vice President Jorge Glas - a potential candidate to succeed Correa in elections next February - flew into the disaster zone within hours to oversee rescue and relief efforts. But some survivors complained about lack of electricity and supplies, and aid had still not reached some areas. The number of injured rose to over 2,600. Shaken Ecuadoreans lined up for food and blankets, slept in the rubble of their destroyed homes or congregated in the street after the most destructive quake since a 1979 magnitude 7.7 quake killed at least 600 people and injured 20,000, according to the U.S. Geological Survey. Fears of looting spread as in Portoviejo people stole clothes and shoes from wrecked buildings and police tried to control crowds. A former social security building was ransacked for aluminum window frames and cables by people hoping to sell the materials. "I have to take some advantage from this horrible tragedy. I need money to buy food. There's no water, no light, and my house was destroyed," said Jorge Espinel, 40, who works in the recycling business. Elsewhere, armed men robbed two trucks carrying water, clothes and other basics to quake-hit beach locality Pedernales. There, survivors curled up on mattresses or plastic chairs next to flattened homes. Soldiers and police patrolled the hot streets while rescuers searched for survivors. Earlier, firefighters entered a partially destroyed house in Pedernales to look for three children and a man apparently trapped inside, as a crowd gathered to watch. "My little cousins are inside. Before, there were noises, screams. We must find them," pleaded Isaac, 18. Tents sprang up in the intact stadium to store bodies, treat the injured, and distribute water, food and blankets. Bruised and bandaged survivors wandered around while the more seriously injured were evacuated to hospitals. Over 300 aftershocks rattled survivors huddling in the streets, worried their already cracked homes could topple. "We're scared of being in the house," said Yamil Faran, 47, in Portoviejo. 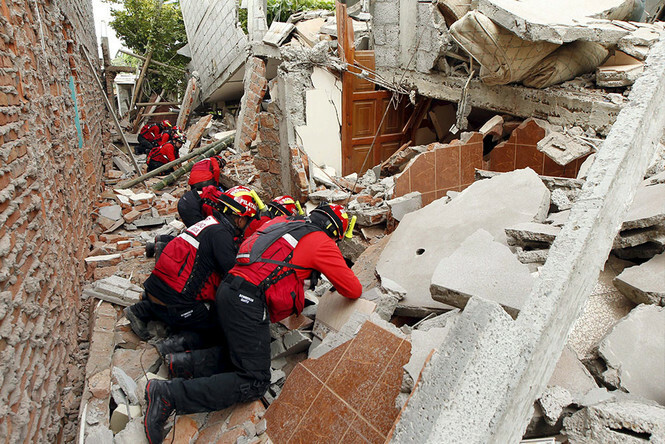 "When ... the aftershocks stop, we're going to see if we can repair it." Some 130 inmates climbed over the collapsed walls of the town's low-security El Rodeo prison, although more than 35 were recaptured. The government has mobilized about 13,500 security personnel to the affected areas. Nearly 400 rescue workers flew in from various Latin American neighbors, along with 83 specialists from Switzerland and Spain. Cuba was sending a team of doctors. Two Canadians were among the dead. Jennifer Mawn, 38, and her 12-year-old son, Arthur, died when the roof of their coastal residence collapsed. 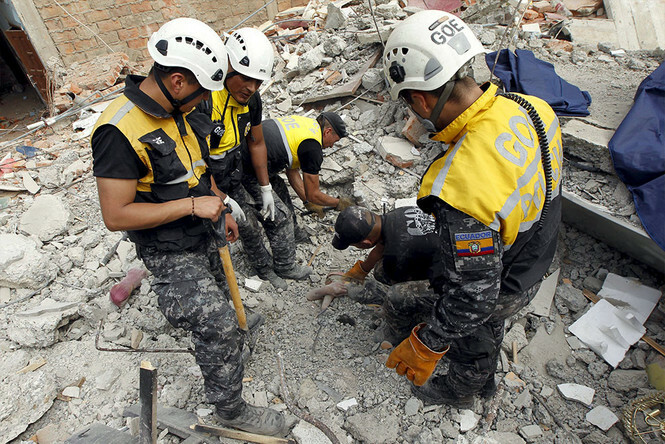 One U.S. citizen is also confirmed to have died in the quake, the State Department said on Monday. And Britain's Guardian newspaper said Sister Clare Theresa Crockett, 33, a missionary nun from Derry in Northern Ireland, also died. To get finance the costs of the emergency, some $600 million in credit from multilateral lenders was immediately activated, the government said. But the disaster may also push Correa, a leftist, to seek help from the International Monetary Fund, consultancy Eurasia said. "Such dynamics increase the odds of Correa turning to an IMF Program for support, an option he has so far resisted, and the earthquake could provide him with political cover to do so," it said.